The proposed monument by John Meirion Morris. Picture of Llyn Celyn by Richard Szwejkowski (CC BY-SA 2.0). 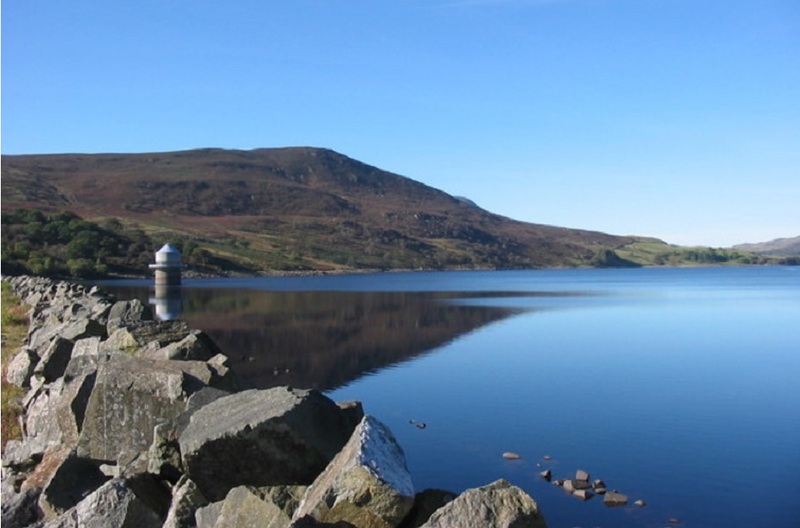 Social media would make all the difference if there was a renewed effort to build a permanent memorial to the Tryweryn drowning, according to the man behind the campaign. Dylan Edwards, from Bala, was chair of the “Cofeb Tryweryn” (Tryweryn Memorial) fund that attempted to build a memorial in the late 1990s. As well as a social media campaign to raise the funds, he has called on the Welsh Government to finance some of the cost of the memorial. 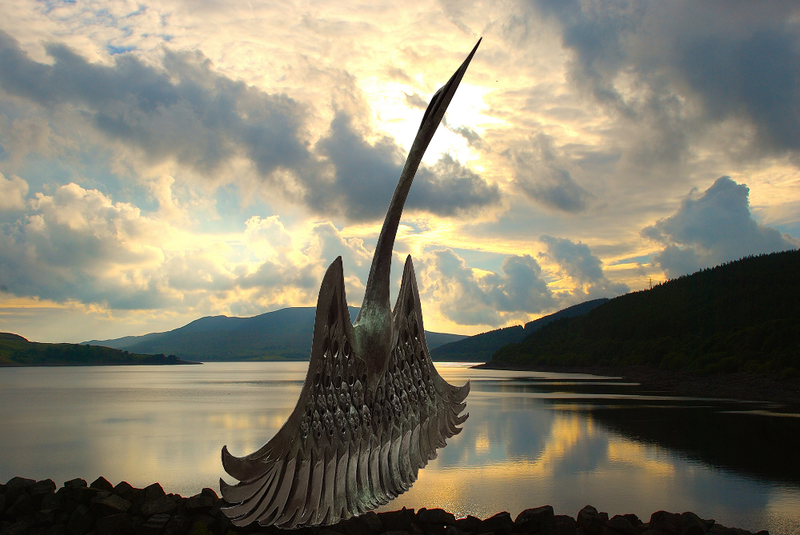 The memorial would have been based on a design by sculptor John Meirion Morris and the campaign group had liaised with Snowdonia National Park to position it near the dam on the site. Dylan Edwards estimated the cost at somewhere between £250,000 and £300,000. He said the flooding of Capel Celyn by Liverpool Corporation Waterworks was a “national tragedy” and deserves a “majestic memorial”. The campaign first started in 1997, when a group came together before the National Eisteddfod in Bala, just under 40 years following the vote to flood the Tryweryn Valley. Their charitable objectives were to “advance the education of the general public by the provision and maintenance of a memorial to commemorate the flooded valley of Tryweryn”. Calls for a new monument to Tryweryn, almost 55 years after the flooding, were renewed after the “Cofiwch Dryweryn” mural was defaced. Dylan Edwards said that the flooding of Capel Celyn by Liverpool Corporation Waterworks was a “national tragedy” and deserves a “majestic memorial”. “A barbaric act perpetrated against a defenceless community of civilised people and the destruction of a school a chapel and a village and farms and a graveyard,” he said. MP for Meirionnydd Nant Conwy at the time, Elfyn Llwyd, called on the Council to take a step further and fund a memorial statue. When asked about the campaign, he told Nation.Cymru that “the fund was regrettably very badly handled”, and that he wasn’t allowed to be associated with the campaign. Mr Llwyd, who is now a solicitor, also confirmed his support for a new campaign to get a permanent monument for Tryweryn. The charity, Ymddiriedolaeth Cofeb Tryweryn, was unregistered as a charity in 2009. Would you be willing to donate to a campaign to build the permanent Tryweryn Memorial? 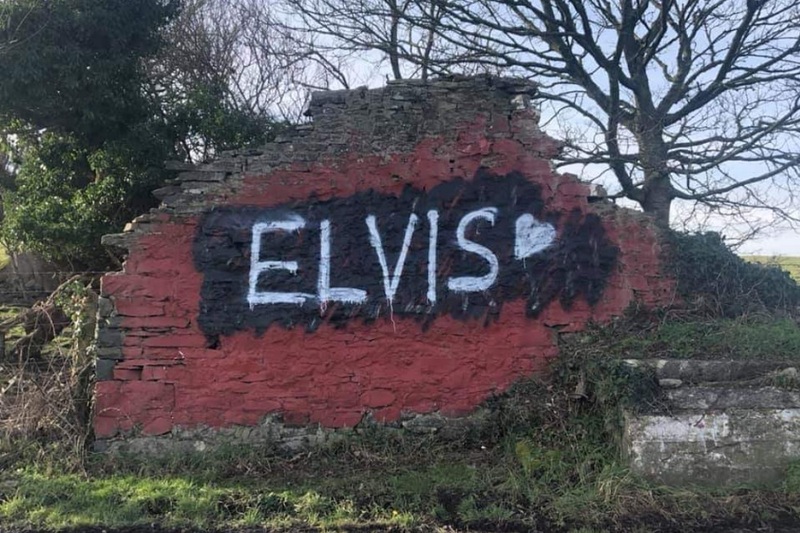 Plaid Cymru Assembly Member for South Wales West Bethan Sayed, who wrote an opinion piece on defending the mural at the time of the vandalism, said she was strongly behind renewing a campaign to “keep our collective memory alive”. In a string of emails to the Deputy Minister for Culture, Sport and Tourism, Independent AM Dafydd Ellis-Thomas, she asked for discussions to begin for the creation of a permanent monument. In his reply he said that there were “already two great memorials on the shores of Llyn Celyn; the Remembrance Chapel alongside the graveyard where the remains of families who chose to do so were reburied and a memorial garden designed by the architect R L Gapper and who described it as the ‘boat of our culture coming ashore’. “The other is the bilingual remembrance slate above the dam which tells the history of its building. Detail from John Meirion Morris’ Tryweryn monument. Picture by Mark Rees. 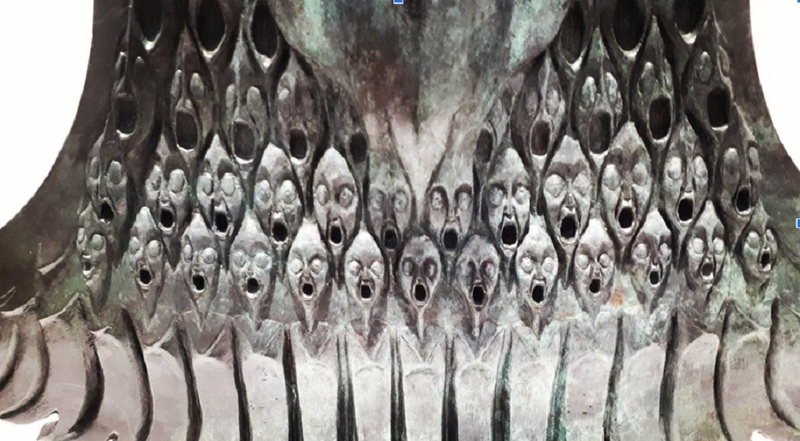 The original plan was to turn the sculpture into a 28-foot high bronze monument which John Meirion Morris himself identified to the BBC as “a bird and a choir, but a choir singing protest songs – even shouting protest songs… there’s a mass of faces there, angry and determined”. Gary Price, who lives in Porthmadog and drove past Capel Celyn twice a day on his commute to Deeside, has only just seen the sculpture but thinks it’s time to get a worthy memorial. “I believe it to be a more fitting memorial to Tryweryn than a painted wall over 60 miles away,” he said. But plans to build a memorial weren’t without criticism. An article published by the BBC in 1999 gave an account of how an old pupil of Capel Celyn school (whose uncle was the chairman of the Capel Celyn Defence Committee) claimed that relatives of people who lived in the drowned village were against the monument. Politicians proposed an early day motion in Parliament and a statement of opinion in the Assembly; Both proposed by Labour’s (later Plaid Cymru) Ron Davies of Caerphilly. The political acts commended “the 35 of the then 36 Welsh MP’s who unsuccessfully opposed the flooding”. But the motion to Parliament was only supported by 8 Welsh Members of Parliament out of the 40 elected in the 1997 general election. The motion to the Assembly saw a slightly higher turnout with 21 of the 60 elected AM’s supporting the statement. In 2005, the then Council Leader of Liverpool City Council, Mike Storey, said he’d consider supporting the campaign. “I would be quite happy for the city to make a contribution, but I equally feel that the public should get behind it”, he said. The City Council responded to Nation.Cymru by saying that there has been “no recent approaches requesting support for the creation of a new monument at this site”. A spokesperson said, “On behalf of the whole city, Liverpool Council offered a sincere apology in 2005. “The now Mayor of Liverpool Joe Anderson was the Leader of the Opposition at the time, and was a personal signatory to that apology.